Pain associated with LSS can be quite debilitating and can result in a significant decrease in overall activity. Pain with LSS is usually located in the low back itself, and often results in leg pain because of the pressure that narrowing puts on the nerve roots leaving the spine. Other hallmark symptoms include increased pain with standing and walking, relief with sitting, decreased strength and flexibility in the legs and decreased reflexes in the legs. Physical therapy (PT) is a very viable option for treating LSS. In recent years, a good body of literature has been building in favor of PT over surgery for LSS. A study very recently published in the Annals of Internal Medicine on April 7, 2015, demonstrates that PT is just as viable an option for treating LSS as decompression surgery. Patients were randomly assigned to either a surgery group or an evidence-based PT group and followed over the course of two years. After two years, both groups demonstrated similar reductions in pain and other symptoms. Since PT has lower risk and cost associated with it when compared to surgery, it seems it should be considered as the first line of treatment for LSS. Please keep in mind not all back pain is created equally. 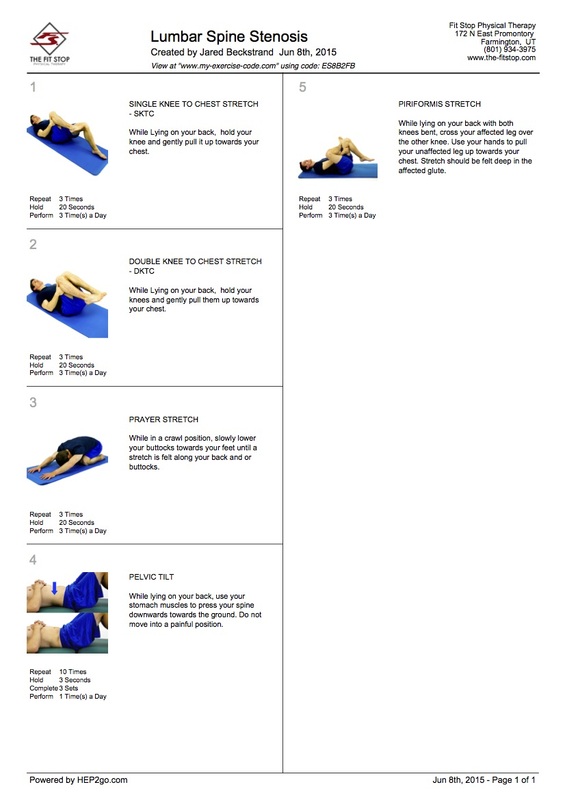 While these exercises are ideal for a specific population they may not be the best for all low back pain. The best thing you can do to treat your back pain is to go get it checked out by a healthcare professional. 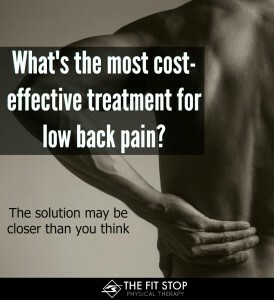 Physical therapists at the Fit Stop are highly trained therapists with specialized training in treating LSS. After a thorough initial evaluation, your therapist will detail a customized plan of care for your LSS. If the plan is followed with consistency, physical therapy will allow you to manage your pain related to LSS, and allow for a more active lifestyle and improved quality of life. Disclaimer: The information presented on this website is designed to be used for informational purposes only. The diagnoses and treatment plans outlined are extremely generalized and may or may not be the recommended interventions for your specific problem. If you are experiencing pain, you are encouraged to consult a healthcare provider to determine the best treatment plan that will be in your best interest individual. Fit Stop Physical Therapy claims exemption from accident, injury, or perpetuation of any injury incurred while performing exercises found on this website. The user assumes all risk … and reward !! Very timely, nephs and bro! I have been experiencing lower back pain for weeks and more recently, spasms. 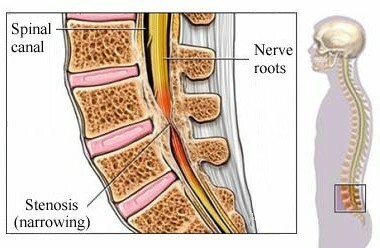 I assumed it was sciatica but I haven’t felt the pain down my legs usually associated with that so maybe it’s spinal stenosis! I’m well over 50, that’s for sure. I’m still too fat so I’m sure that doesn’t help either. I have to cover last two days of scout camp starting Thursday night so I’ll start exercises immediately. I’m coming up with Lexi end of the month so maybe I’ll stop in to see you. 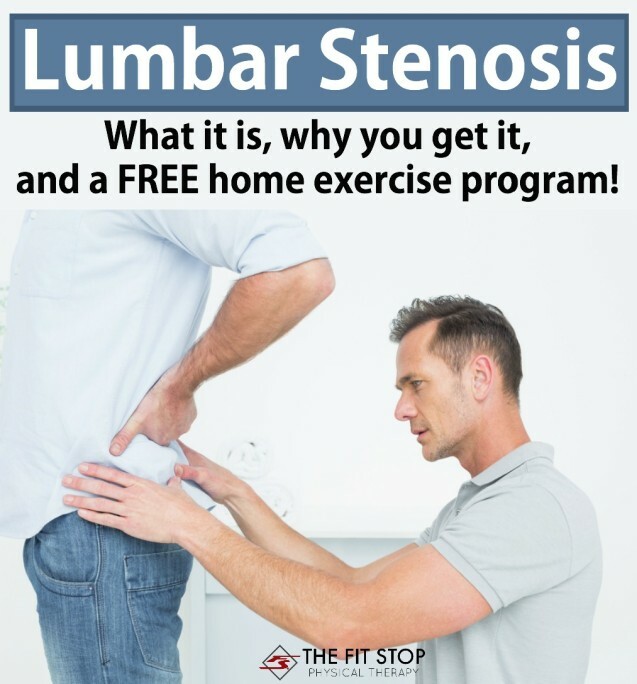 In case it is sciatica and not stenosis, I’m assuming these exercises will help that too? Hi Steve! Sciatica can actually be one of the symptoms caused by stenosis. These exercises should help you out, but we’d love to see you in the clinic if you need any additional help!